AMP-activated protein kinase (AMPK) is a fuel-sensing enzyme that is activated when cells experience energy deficiency and conversely suppressed in surfeit of energy supply. AMPK activation improves insulin sensitivity via multiple mechanisms, among which AMPK suppresses mTOR/S6K-mediated negative feedback regulation of insulin signaling. In the present study we further investigated the mechanism of AMPK-regulated insulin signaling. Our results showed that 5-aminoimidazole-4-carboxamide-1 ribonucleoside (AICAR) greatly enhanced the ability of insulin to stimulate the insulin receptor substrate-1 (IRS1)-associated PI3K activity in differentiated 3T3-F442a adipocytes, leading to increased Akt phosphorylation at S473, whereas insulin-stimulated activation of mTOR was diminished. In 3T3-F442a preadipocytes, these effects were attenuated by expression of a dominant negative mutant of AMPK α1 subunit. 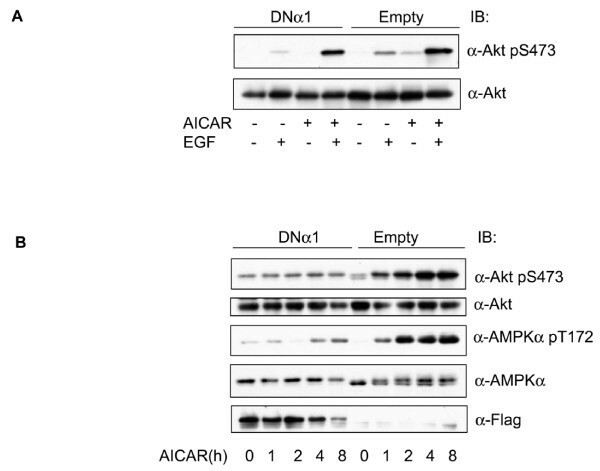 The enhancing effect of ACIAR on Akt phosphorylation was also observed when the cells were treated with EGF, suggesting that it is regulated at a step beyond IR/IRS1. Indeed, when the cells were chronically treated with AICAR in the absence of insulin, Akt phosphorylation was progressively increased. This event was associated with an increase in levels of phosphatidylinositol -3,4,5-trisphosphate (PIP3) and blocked by Wortmannin. We then expressed the dominant negative mutant of PTEN (C124S) and found that the inhibition of endogenous PTEN per se did not affect phosphorylation of Akt at basal levels or upon treatment with AICAR or insulin. Thus, this result suggests that AMPK activation of Akt is not mediated by regulating phosphatase and tensin homologue (PTEN). Our present study demonstrates that AMPK exerts dual effects on the PI3K pathway, stimulating PI3K/Akt and inhibiting mTOR/S6K. AMPK exerts pleiotropic effects on cellular metabolism and has been emerged as a therapeutic target for the metabolic syndrome . The activation of AMPK improves insulin resistance by stimulating glucose uptake and lowering blood glucose and lipid levels, whereas the activity of AMPK is suppressed in disorders associated with insulin resistance [2, 3]. On the other hand, it increases fatty acid oxidation and inhibits fatty acid and protein synthesis, which is apparently opposite to the insulin action . The latter often concurs with the scenarios when cells confront energy crisis. At molecular levels, complex relationship exists between the AMPK and insulin signaling pathways. 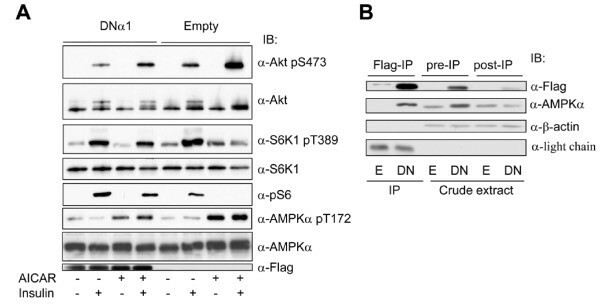 For instances, AMPK has been reported to regulate IRS1 [4–6] and Akt/PKB [7–12], while insulin and Akt have negative impacts on AMPK activation [13–15]. The major effector of insulin is phosphoinositide 3-kinase (PI3K), which is activated by binding of the p85 regulatory subunit to specific sites on IRS1/IRS2 that are tyrosine-phosphorylated by the insulin receptor . Activated PI3K phosphorylates phosphatidylinositol [4, 5]-bisphosphate (PIP2) at 3' position, whereas phosphatase and tension homologue (PTEN) dephosphorylates this site and thus turns off the signal. 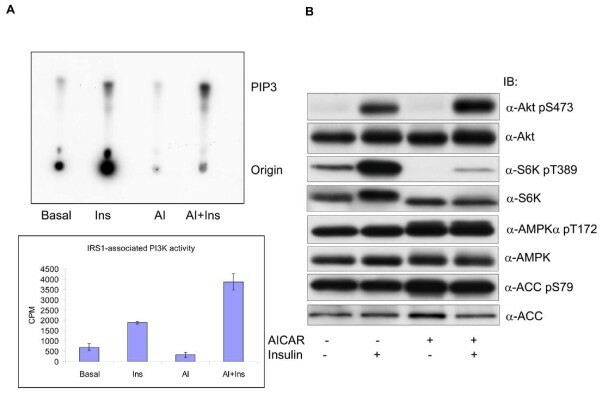 Increased PIP3 recruits PDK1 and Akt to the plasma membrane whereby Akt is activated and becomes a major player of insulin action. An important modulator of inulin action is the mammalian target of rapamycin (mTOR), a member of the phosphoinositide kinase-related family that possesses exclusively protein kinase activity. mTOR functions in a mitogenic pathway downstream of PI3K and is activated by insulin and other mitogens in the presence of sufficient nutrients such as amino acids and glucose . Activated mTOR regulates protein synthesis via phosphorylation of its targets, such as activation of S6 kinase 1 (S6K1) and inhibition of the initiation factor 4E binding protein (4E-BP1). In addition, mTOR and S6K1 have been shown to induce serine/threonine phosphorylation of IRS1 to attenuate signal flow to downstream effectors, and thus play a role in insulin resistance . In contrast, when cells sense a shortage of nutrients, for instance, reduced cellular levels of glucose, or other stresses that deplete intracellular ATP, mTOR is inhibited and protein synthesis slows down, allowing ATP to be used for processes more critical to survival. This event is largely controlled by AMPK . In fact, many studies have shown that the activation of AMPK leads to an inhibition of mTOR/S6K1 . This occurs via phosphorylation of TSC2, an mTOR inhibitor [20, 21], and Raptor, a scaffold protein of TORC1, essential for mTOR activity . It is well established that AMPK enhances insulin sensitivity and ameliorates insulin resistance. However, the underlying molecular mechanisms are not fully elucidated. The net effect of AMPK on insulin signaling is complex, with multiple targets involved depending on the cellular context. Although a few studies have shown that AMPK inhibits Akt , many found a positive effect [7, 8, 11, 15, 25]. 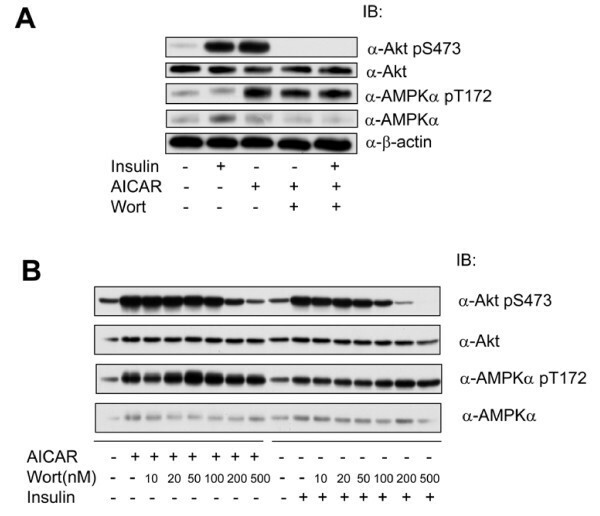 Thus, AMPK activators such as AICAR, metformin or adiponectin enhance the effect of insulin on Akt activation, an event that is inhibited by overexpression of dominant negative mutant of AMPK [7, 8, 11, 15, 25]. A previous study has shown phosphorylation of S789 on IRS1 in vitro by AMPK and in vivo by AICAR in C2C12 myotubes , leading to an increase in IRS1-associated PI3K activity without changes in phosphorylation of tyrosine residues on IRS1 and its association with p85 regulatory subunit of PI3K. In contrast, Qiao and coworkers have reported that phosphorylation of S789 is associated with insulin resistance, which is not attributed to AMPK . In addition, Tzatsos and Tsichlis have reported that AMPK activation induces phosphorylation of IRS1 at S794, leading to an inhibition of PI3K/Akt signaling . The reason underlying this discrepancy is currently unclear. Although our study showed that AMPK activation enhanced insulin-stimulated IRS1-associated PI3k activity and subsequent activation of Akt, this probably occurs through regulation of PI3K. This is supported by three lines of evidence. First, Akt is directly activated by treatment of cells with AICAR in the absence of insulin and suppressed by Wortmannin. Second, AICAR increases the level of PIP3. 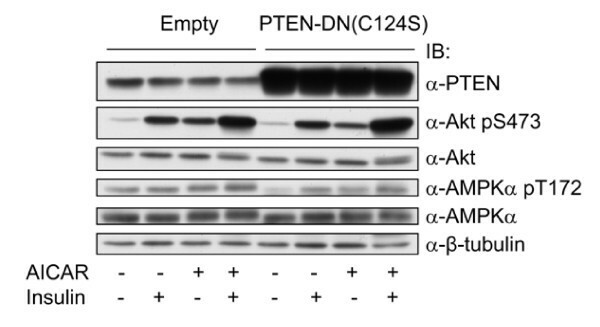 Third, overexpression of the dominant negative mutant of PTEN does not seem to exert any effect on Akt activation, regardless that the finding is surprising to us, which is contrary to existing dogmas and probably reflects a cell-type difference. Our findings are in line with those of Ouchi et al, where it has been shown that adiponectin activates Akt in endothelial cells, which is dependent on AMPK and suppressed by PI3K inhibitor-LY294002 [7, 8, 11, 15, 25]. Hyperactivation of the mTOR-mediated pathway(s) has been observed in insulin desensitizing events and insulin resistant animal models [26–31]. This can be prevented or reversed by rapamycin [30, 31]. Likewise, deletion of S6K1 alleles increases insulin sensitivity and protects mice against age- and diet-induced obesity . The inhibitory effect of mTOR/S6K1 on insulin signaling correlates with increased S/T phosphorylation of IRS1 at three sites, S307, S636/S639. Recent studies have established that activated AMPK inhibits mTOR by phosphorylation of TSC2, a negative regulator, and Raptor, a positive regulator of mTOR, respectively [20–22]. The cDNA for dominant negative mutant of human AMPK α1 catalytic subunit was kindly provided by Dr. Carling  and cloned by PCR into a lentiviral vector where a flag epitope was added to the amino terminus of the α1 mutant. Lentivirus was prepared and the cells infected as described previously [35, 36]. The cDNA for PTEN (C124S) in pSG5L (Addgene, Cambridge, MA) was digested with BamHI and EcoRI and subcloned into the same Lentiviral vector as used for AMPKα1 (TET-OFF) [35, 36].